Cricketers asking their teammates for the decision review is a common thing in cricket, but how many times have you seen a batsman asking the opposition about an edge. A confused Faf du Plessis did exactly the same as he was unsure about the edge and asked Niroshan Dickwella if he had got one. 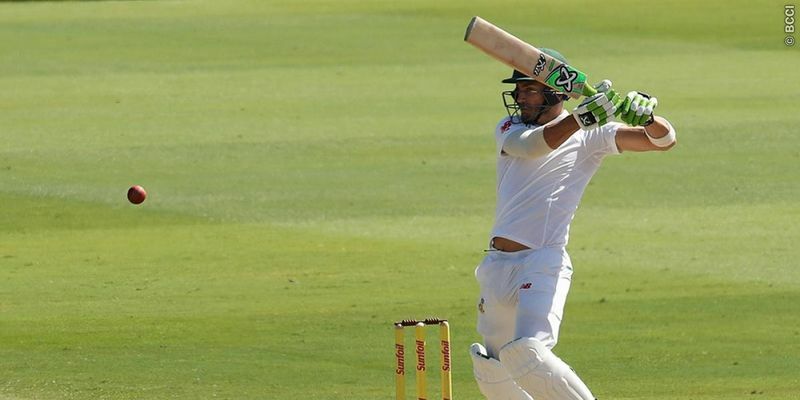 The first day of the first Test between South Africa and Sri Lanka was full of action and a lot of funny moments to savour. While Dean Elgar kicked the stumps like a footballer to leave Dale Steyn frustrated, Faf du Plessis gave another moment of the day when he asked the opposition about his edge. On the second ball of the 25th over, Kasun Rajitha, who had a tough day finding his line and length, bowled a good length delivery down the leg-side. It was well in the course to go for a four, but instead of glancing it properly, du Plessis could only manage to tickle it. The failure in deviating the length means it was gobbled up by wicket-keeper Niroshan Dickwella easily. However, the umpire was not interested in the appeal and turned that down, Dickwella seemed confident enough to convince Dimuth Karunaratne to go for the review. Seeing that confidence, du Plessis was also taken aback as he was heard on stump mic asking about the edge to Dickwella. The UltraEdge found that there was some sound when the ball passed the bat and the third umpire concluded that it was a clear case of a dismissal. He signalled du Plessis out, and rightfully so. But that incident made for a funny viewing.